Taekwondo teaches kids success skills for life! Looking for a fun new activity for your 5 or 6 year old child? 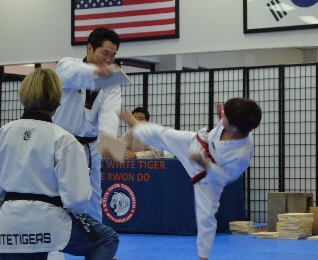 Consider Texas White Tiger Tae Kwon Do classes for preschoolers and kindergarteners. Fun drills help children develop coordination, balance, and gross motor skills. Little Tigers learn to punch, kick, run, jump, practice in a group, and with a partner. Little Tigers have a great time while improving their confidence, fitness, athleticism, and enjoying being physically active. Our program provides benefits beyond the classroom by preparing children for greater success in school and other team sports. Our Little Tigers program uses a small student to teacher ratio in order to ensure that each child gets the individual attention needed to properly learn the fundamentals we teach. Little Tigers instructors are enthusiastic, patient, friendly, motivating, and encouraging, and have experience working with young children. Instructions are presented in language appropriate for young children. Techniques are demonstrated and taught in a step by step manner that children can easily understand, Our Little Tigers program is designed to help students develop self-confidence and healthy self-esteem through encouragement, praise, and to motivate them to attempt new activities in class. We use a variety of different training tools, drills, and teaching methods to keep classes exciting, challenging, and fun. Our Little Tigers curriculum was designed specifically for these young students, and leads the children through a series of striped belts on a regular schedule as they learn new techniques. Children learn to set and achieve goals, build self confidence and feel good about themselves. Trial Program which includes classes and a uniform! We are confident getting your child involved in Tae Kwon Do will be one of the best decisions you ever make! Come see for yourself the difference martial arts classes at Texas White Tiger Tae Kwon Do can make in your child's life. Copyright © Texas White Tiger Tae Kwon Do. 2009-present. All rights reserved.